Preheat the oven to 400. Line a baking sheet with parchment paper or a silicone baking mat. Combine the flour, baking powder, sugar, and butter in a food processor bowl and blitz a few times until everything is blended and it looks sandy. Transfer the mixture of a medium bowl. Alternatively, put these ingredients in a medium-sized bowl and rub the butter through the dry stuff with your fingers until you get that sandy look and none of the butter pieces are larger than a pea. Add the milk, yogurt, and maple syrup and gently fold until nearly combined. 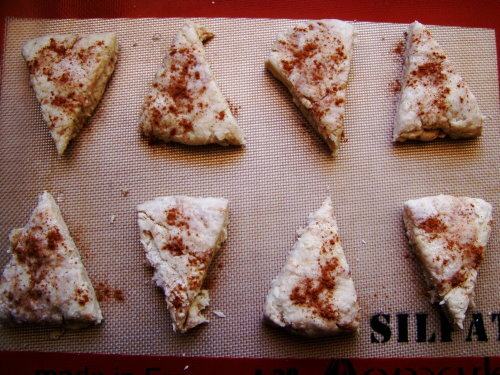 When there are only a few pockets of dry ingredients left, add the cinnamon and fold a few more times until you have a shaggy mess that just about hangs together. Turn the mess out onto a lightly floured cutting board and gently knead two or three times until it hangs together a bit more. Pat the dough into a round disk, approximately ¾ of an inch thick and cut into 8 wedges. If there are a few bits of dough straggling around, that’s okay – just pat them on where you can. The key here is to avoid over-handling the dough. Carefully transfer the wedges to the prepared baking sheet. Dip a pastry brush in a splash of milk or cream and paint the tops of the wedges with it. Sprinkle the tops with a splash of extra cinnamon, if you like. Bake for 15 minutes. 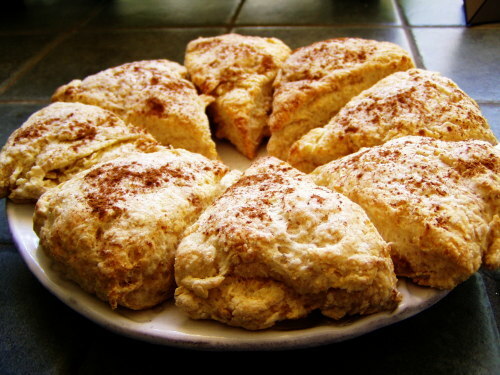 When they are done, the kitchen will smell faintly sweet and the edges of the scones will be golden. Serve warm with butter and a bit of jam. Yum, yum, yum!! I finally got around to making these and they are my new favorite breakfast item. Perfect flavor and texture - thanks again, Bria! Hooray! I’m so glad they turned out. Definitely try mini chocolate chips in them sometime - also totally delicious. Ich habe noch nicht viel von dem erreicht, wonach es mich drÃ¤ngt. Aber selbst wenn ich einmal die ganze Welt besessen haben sollte, wird das GefÃ¼hl nicht aufhÃ¶ren, lÃ¤nger leben zu wollen, um das, was es noch alles gibt, erleben zu kÃ¶nnen.Selten so schÃ¶n gehÃ¶rt, danke fÃ¼rs Aufschreiben! Und 1000 liebe GrÃ¼ÃŸe an den Freund mit der GroÃŸtante â€“ von GroÃŸneffe zu GroÃŸneffe! The Salty Spoon is powered by	WordPress 2.7 and delivered to you in 0.236 seconds using 24 queries.